An app that helps young children develop their understanding of letters by teaching how to write each letter through its Trace feature and make learning English alphabets simple and easy. 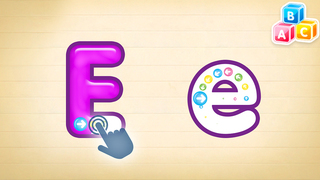 The aim of this app is to help young children develop their understanding of letters. It does this in a couple of different ways and means to help the user not only recognise letters but know their sounds and how to write them. Because of this the child can utilise the app to gain a good understanding of the letters of the alphabet but also it will help them when they begin the process of reading as they will already have prior knowledge of the sounds of each of the letters. On opening the app the user is taken to the opening page where it is apparent that the app is going to be very user friendly to the younger audience it is aimed at. There are a number of animated characters across the screen (called Nemies by the developer) that each represent a letter and so embody the shape of the word attributed to that letter. For instance A is for Apple so the Nemie for A looks somewhat like an apple. B is for Bear so the B Nemie looks like a bear, and so on. Once you have clicked the Start button then you are straight into the app itself. The game play is extremely simple and intuitive and even though there is an instruction guide within the app it is not necessarily needed due to the simplicity of the app. The instruction manual can be found within the ‘Grown Up’ area. This can be accessed at any time by clicking on the small building blocks in the top right-hand corner of the screen. This menu also allows you to skip through to different letters in the alphabet if you wish. Also in this section there is further information about the developer, other apps on offer and links to the developer’s website. The website itself is also very useful and has video clips and further information about to use and make the best out of the app. There is also information on how the app can help develop young people’s knowledge of letters and sounds. The app itself starts off with each letter and asks the user to trace both the upper and lower cases of the letter so they can understand how the letter is correctly written. From an education perspective these are all correctly done with circles all being drawn anti-clockwise. As the user is tracing the letters the app speaks the sound for each of the letters. This is continually repeated to make sure that the user fully understands what the letter sound is. This is also where this app sits more in the American market than the English with some letter sounds being different, for instance the H, M and N letter sounds. Once the user has successfully traced out the letters (if they do it incorrectly they can keep trying until they get it right) a small clip opens up with the attributed Nemie, and an animation helping the user to further understand and know how to successfully use the letter. The addition of the video clip and of the specific Nemies for each of the letters adds a lot to the app and takes it from being a simple letter tracing app to something that a child will continue to return to and want to learn from. Overall this is a really fun app that will keep young users engaged as they discover the different Nemies for each of the letters and find out more about them. It will also help young children in the journey to becoming confident with letters and sounds as it will help them to identify, write and use the letters in the correct fashion. 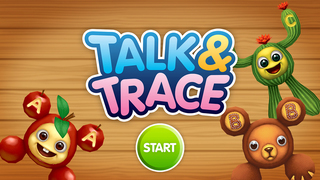 Badanamu Alphabet Talk and Trace makes learning the ABCs great fun! To pre-k and kindergarten children learning the alphabet can be a bit overwhelming. Badanamu brings the fun back to the alphabet. We make letters and sounds relatable to children by using silly sounds, catchy music, and adorable characters. Letters aren’t just boring old letters anymore! Now they are living creatures we like to call Nemies. Remember hearing “A is for apple” as a child? Now A is an apple. The A Nemie character looks and sounds like an apple, helping children easily remember the shape and sound of the letter A.
Tracing letters has never been more smooth and confidence building for children. Each of the ABCs has a traceable capital and lower case letter. As children touch the screen to trace, the letter sings out its sound. Try tracing your way through all 26 letters of the alphabet. 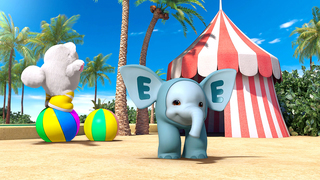 After children finish tracing each letter they are greeted by that Nemie character in a fun and memorable animation. Learn letter shapes and writing strokes. Learn keywords for each letter. Does your little one love Badanamu Alphabet Talk and Trace? Is there something you would like to see changed? We would love to hear what you think about our application. Simply leave a review below or send us an email. Badanamu has a whole world of learning just waiting for children to discover. Follow us on one of our social media accounts to hear the latest about our products and animations.